New Era’s attention to detail and customer requirements is what makes us a world leader in cleanroom web processing lines. When you require equipment designed to meet your cleanroom needs, look to New Era to provide you with the complete system. New Era takes great care in the design of its clean room unwinds to minimize the number of debris generating components on the equipment, shroud any moving components under enclosures and apply special cutting techniques to minimize the debris generated during splicing. All this is accomplished while still allowing the same equipment features as New Era’s general purpose unwinds. New Era engineers each cleanroom coater exclusively for use under these special conditions. This requires that the equipment be designed with certain features, including the number of debris generating components minimized and moving components under enclosures, leaving a clean configuration, with all exposed elements of nickel plated or stainless steel construction. New Era takes great care in the design of its clean room laminators and embosser, to both minimize the number of debris generating components on the equipment as well as shroud any moving components under enclosures. This leaves a clean configuration between the frames, with all machine members being of nickel plated or stainless steel construction. New Era has provided fully integrated roll handling systems for use in the strictest cleanroom environments. Great care is taken in the design of this equipment to assure that the handling of the rolls is done while minimizing the generation of debris. 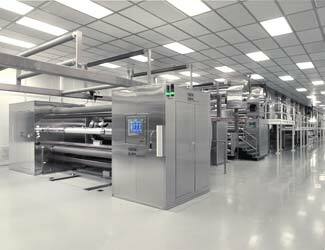 New Era engineers its cleanroom web handling equipment exclusively for use under these special conditions. This requires that the equipment be designed with certain features, including the number of debris generating components minimized and moving components under enclosures, leaving a clean configuration, with all exposed elements of nickel plated or stainless steel construction. New Era takes great care in the design of its clean room equipment to minimize the number of debris generating components on the equipment, shroud any moving components under enclosures and incorporate special cutting methods designed to reduce debris generated while cutting. All this is accomplished while still allowing the same equipment features as a standard New Era turret winder designed for a general purpose environment.